ESR Tube is used in blood collection and anticoagulation for sedimentation rate test.It contains a 3.8%(0.129mol/L) or 3.2% (0.109mol/L) buffered tri-sodium citrate solution with the mixing ratio of 1 part citrate solution to 4 parts blood.ESR measurement refers to the Westergren method. ESR fast detector is made up of plastic frame with a graduation scale indicating ESR values and a stainless steel motherboard.It is suitable for the ESR tests for subjects of different gender and ages,with higher related coefficient comparing with theWestergren method. ��ESR fast detector is designed to match IMPROVACUTER �� ESR butes (specification:1.6ml/9×120mm) for testing the Erythrocyte Sedimentation Rate (ESR),which is a non-specific assay item. ��It is safe,reliable and easy to read with clear scales. ��ESR fast detector should be placed stably without wobble and draught. ��It should be kept erect with a slope angle less than 2��. 1��Make use of ESR tube and needles to obtain the blood specimen by venipuncture. 2��Gently invert ESR bute at least 8-10 times.Avoid of fierce shake to destroy the Erythrocytes. 3��Repeat before inserting Tube into Stand. 4��Isert ESR tube into Stand. 5��Align zero level of scale to bottom of meniscus. 6��Set timer and read erythrocyte level after 30 min. 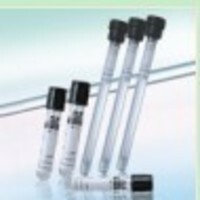 7��Discard ESR tubes without opening.